The simplest way to progress the session along is to go from unopposed to semi-opposed to fully opposed pressure within the same activity. In the activity below, the session starts out unopposed with the players doing developmental repetitions of a stop start. They then progress to an end zone game where they must stop the ball in the end zone without the defending keeping up alongside them (semi opposed as the defender cannot tackle). Finally, the game becomes fully opposed where the defender is live after the first touch. The activity starts unopposed as players learn the stop start move they're working on. The session progresses to semi-opposed where the defender is trying to keep up and stop in the end zone alongside the attacker. One way to add pressure and progress a session is to make it more competitive. By making it into a competition, you can increase the realism and tempo of most activities. In the same setup as before, the winner (player who scores the most points) in the Championship gets promoted to the Premier League. The player with the least points in the Premier League is relegated to the Championship. Though a minor progression and tweak to the session, the competitiveness and result of each game begins to matter that little bit more to the players within it. (NOTE: consider which players you start in which division and why). Attacker earns 1 point for stopping in an end zone whilst the defender isn't there (e.g. lose the defender and score). The final progression we're going to look at is how to move from one activity to another in order to meet different learning outcomes. 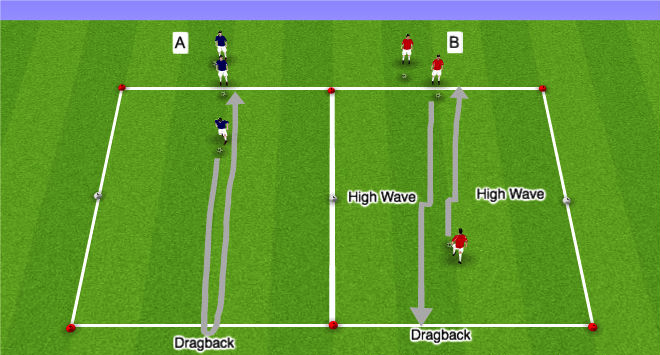 In the example below, the new activity illustrates where on the field you might use the stop start and gives the players visual cues and concrete examples of where, when and why they might use the move to beat a defender. While the move stays the same (stop start) the attacker also has other options (e.g. the takeover/overlap). Therefore, decision making becomes a new component of the practice as there is a second attacker that can be utilized as a decoy or someone to combine with. The progression to a new activity now hits all 5 W's (Who, What, Where, When, Why - read more here). The stop start game can eventually move on to scoring in gates or goals to make it more realistic and competitive. Progressing from mini games to a specific scenario, the coach is able to illustrate where, when and why the stop start might be used. There are a ridiculous number of ways in which you can progress and adapt a session, including all of those above. Off the top of my head; touch limits, rules of the game and field dimensions are just a few that can be be used to challenge players and move the session along to aid a players learning and development on a given topic. What progressions do you use within sessions? Do you skip semi-opposed pressure with younger players? Do you progress things for some players/groups whilst keeping it the same for others? I'd love to hear how others approach progressions, feel free to leave comments below or give me a shout on twitter (@deanatk).